First lady Michelle Obama has been a fashion trend-setter since she first stepped on stage to support her husband’s first bid for the presidency. Not since Jackie Kennedy has the world paid such careful attention to the clothing and hairstyle choices of an American first lady. The always surprising FLOTUS managed to do it again when she debuted her new bangs just before the president’s second inauguration. 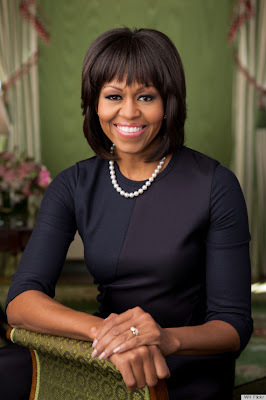 Providing an attractive cap to a face-framing layered cut, the first lady’s blunt-cut bangs sparked plenty of controversy from those who preferred her previous off-the-forehead style; but the bangs have also elicited their share of copycat admiration. Cute-as-a-button gymnast Gabby Douglas, who weathered her own hair controversy during the Olympics when her sloppy ponytail won less than gold medal reviews, put her own spin on the Obama bangs when she walked the red carpet at the Golden Globe Awards in January. Sporting thick, blunt bangs over long loosecurly locks, the now 18-year-old gold medalist was the epitome of the young sophisticate. Dawn by Vivica Fox, a 15-inch-long silky straight page with attractive bangs, mimics Michele Obama’s sleek, face-framing, fashionable style. If you want the same sophisticated look in a longer style, Charli by Vivica Fox offers 18 inches of silky smooth locks with a center skin part and slightly wispier bangs. For Gabby’s thick-bang curly style, choose Cowgirl Haute by Forever Young, a full-bodied wig with gorgeous, eyebrow-skimming full bangs and soft flowing curls that tumble past the shoulders.